Traditionally, attics are considered unappealing spaces. This unfinished portion of your house is probably dark, cramped feeling, and likely to suffer from temperature extremes. So, if renovating the attic is even on your list of options available to you, it may be at the bottom. However, read on to find compelling reasons to move that option to the top. First, remodeling the attic is considered a smart investment in your house. Do a search on the subject, and you’ll find in nearly every state the project would give you a good return on investment. This makes sense. Generally, the cost is less than that of adding on, since many structural elements are already in place. Plus, you are adding to the usable square footage of your home. 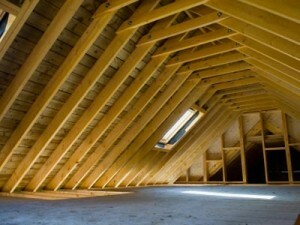 Second, there are many things you can do to make your attic physically comfortable. Talk with a contractor about insulating techniques as well as heating and cooling options. Don’t forget to discuss local building codes. These are in place to keep your home and your family safe. Third, consider design elements that make the space appealing, functional, and unique. The defining features of an attic are its sloped ceilings and shorter walls, known as knee walls. These features lend themselves to two specific design elements: dormers and built-in storage.